Unlike your average compact 92mm air cooler, the Phononic Hex 2’s has a 35W thermoelectric cooler (TEC) embedded in the base, which is powered by a 6-pin PCI-E connector on the side of the heatsink. The TEC part passes a current through a semiconductor, which gets cold on one side and hot on the other, thanks to the Peltier effect. The Hex 2 is basically designed to offer all-in-one (AIO) liquid cooler performance in a compact 92mm heatsink. Of course, condensation is an issue when you cool a device below ambient room temperature, but the cooler’s Standard mode enables on-board temperature sensors to limit the TEC’s power, preventing the base from becoming too cold, avoiding condensation and only ramping up to full cooling power when the CPU is under load. When the TEC isn’t enabled, the unit relies on an internal 92mm fan, heatsink and heatpipes. Other modes are selectable in the Hex 2’s software suite, which connects to the cooler via USB, and also gives you control over the LED colors. Insane mode applies full TEC power at lower temperatures, and the delta T dropped by 5°C when idle as soon as we enabled this mode. However, Phononic warns against using the Insane mode in temperatures above 25°C to avoid condensation – a High Ambient mode is for available these situations. Finally, the Smart Set mode lets you customize these settings for your own environment – as every place is different, we’ve just tested the Insane and Standard modes. 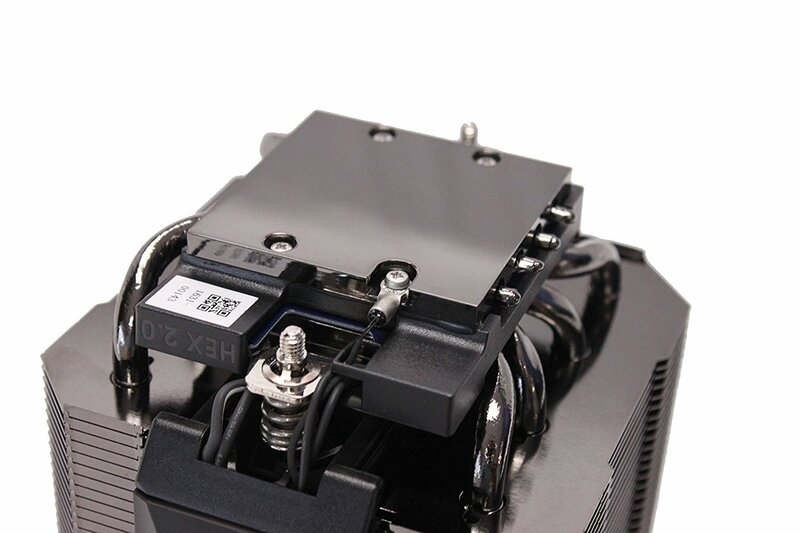 The cooler itself is compact and very well made, plus it’s easy to install with a simple backplate and CPU side mounting plate. The PCI-E power connector may not fit between the cooler and your graphics card, though, so you might need to rotate the heatsink 108 degrees so that the cable points upwards. Meanwhile, the fan has a 4-pin header and is controlled by your motherboard. The cooler isn’t particularly quiet at full speed, but the fan isn’t as loud as most AIO liquid coolers we’ve heard. With the fan at lower speeds, though, it’s close to silent and easily a match for Noctua’s similarly sized NH-D9L. The TEC certainly helped the Hex 2 to better the Noctua too – by 3°C on our LGA1150 rig and 4°C on our LGA2011 system. It came close to bettering Corsair’s H75 too – amazing for such a small cooler. The Phononic HEX 2 performs better than equivalently sized air coolers, it keeps pace with AIO liquid coolers and it’s simple to use although it’s also distinctly niche. Noctua’s NH-D9L offers much better value for money for small overclocks, but if you need more cooling power in a tight space, and an AIO cooler won’t fit, the Hex 2 is a great if pricey option. Very expensive, but effective if you need great cooling in a tight space.